Dudley Moses Mitchell and Opal Blanche Strickler are the parents of my maternal grandmother (great-grandparents). They were set up on a date by Lawrence Elliott. Lawrence was Opal’s brother-in-law and Moses’ nephew. Despite a fifteen year age difference, Opal and Moses fell for each other and were married December 20, 1916 in Topeka, Kansas. They raised five children together, two daughters and three sons. To find work during the Depression, the family moved to Hutchinson, Kansas. They remained there the rest of their lives. Opal and Moses are buried together at the Penwell Gabel Cemetery in Hutchinson, Kansas. I got the chance to pay my respects last October on a research trip to Kansas. The morning we visited Hutchinson was a brisk 30 degrees and windy. These photos were taken very quickly before returning to the warmth of the car! Dudley M. Mitchell Oct 20, 1875 – Mar 10, 1957. Lawrence was born Feb 26, 1892 in Hoyt, Kansas to Lewis Elliott and Melinda Mitchell. 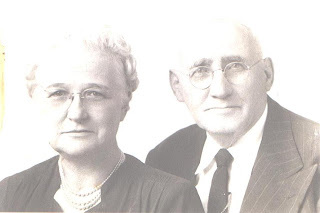 On December 12, 1912 he married Ruby Strickler in Fall River, Greenwood, Kansas. Ruby Strickler was born May 28, 1894 in Narka, Kansas to Abraham Strickler and Effie Amner Flock. Ruby was the middle daughter in a family of 1 son and three girls. The brother died as an infant. Opal was born second on March 1, 1891. Emerald was born last on April 1, 1902. After Lawrence and Ruby were married, Ruby set her older sister up with her husband’s uncle, Dudley Moses Mitchell. 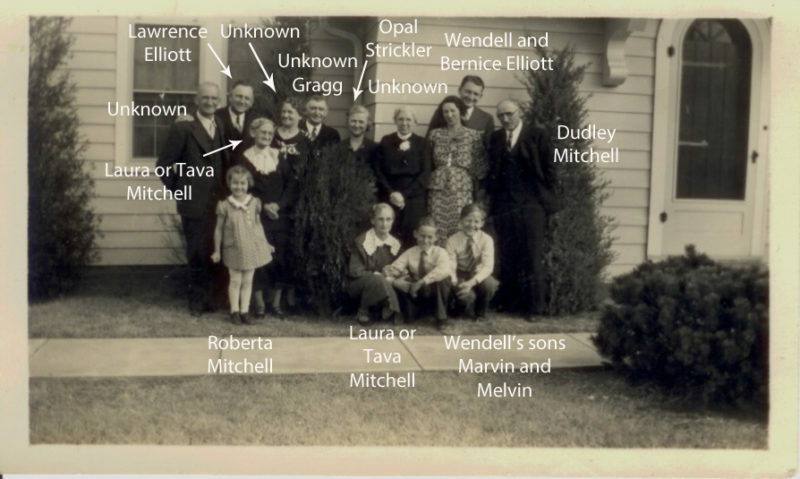 Dudley Moses is the younger brother of Melinda Mitchell, Lawrence’s mother. Despite a fifteen year age difference, Opal and Dudley hit it off and were married on December 20, 1916 in Topeka, Kansas. After the marriage, Lawrence became twice related. He shows up in both the Strickler family line and the Mitchell family line. Lawrence was related to Dudley Moses as his nephew and brother-in-law at the same time. He is my 1st cousin twice removed and the husband of my great great aunt.